RPG Wall | Defenshield, Inc. The RPG WallTM system is a modular pre-detonation screen designed to protect field units from rocket-propelled grenades and other anti-armor munitions. 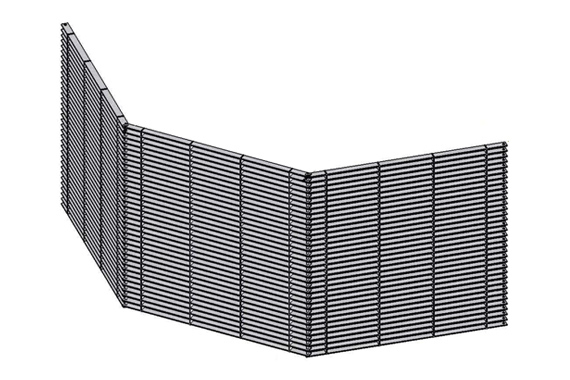 Ideal for combat zones and high-risk areas, the RPG Wall is a simple and effective tool for enhancing the safety and security of high value assets. The RPG WallTM is specifically designed to disrupt duplex warhead attacks. With its modular panel system, the RPG WallTM allows for the construction of a custom-sized wall of varying configurations. Panels are 5 feet x 5 feet and feature a durable, anti-corrosion, powder-coated finish. Each panel weighs approximately 325 pounds. The RPG WallTM is quick and easy to assemble in the field. Panels are connected with a hinge pin and secured with a retaining clip. The wall can then be configured in the required angular positions. A three-panel system takes approximately ten minutes for three people to assemble, with no tools required. This product is not ballistically-rated.